Cwmni Pierotiaid a sefydlwyd yn Haf 2010 oedd y Pier-Echoes – grŵp a oedd yn cynnwys pedwar artist oedd yn cychwyn ennill amlygrwydd. Cydweithiodd Tony Lidington o Promenade Promotions â’r Dr Jane Milling o adran ddrama Prifysgol Caerwysg ar brosiect ymchwil AHRC, ‘Revitalising the Prom’ , ble y byddai cwmni Pierotiaid newydd yn perfformio ar bromenadau, pierau a meinciau parc y Rifiera Seisnig. 0} Ymddangosodd yr Echoes ar BBC Radio Devon a BBC Spotlight a chawsant eu ffilmio ar gyfer pennod o “The Edwardian Farm” ar BBC 2. A van pulls up on the seafront at Paignton on a rain-spattered lunchtime. The doors are flung open and a new (actually pretty old) secret weapon in the battle to revive the British seaside spills out. All afternoon a four-strong pierrot troupe, armed with a guitar, accordion, saxophone and tambourine, cheers up the pensioners huddled in shelters, the families eating egg and chips in the pier cafe, and the bored workers at the crazy golf and trampolines. The Pier Echoes sing, they dance, they tell old-fashioned jokes. And then an academic with a clipboard asks the hardy Devon holidaymakers what they made of it. Funded by the Arts and Humanities Research Council, the project is designed to find out if providing good old live entertainment on the beaches and promenades could help regenerate resorts such as Paignton which, frankly, have seen better days. “There’s very little live acoustic performance that’s free and accessible at the seaside,” said Tony Lidington, better known in the business as Uncle Tacko!, who is overseeing the troupe. “There are a few Punch and Judy professors around but they are regarded as heritage-based performers. We’re trying to take a historic art form and find out if it could work now and in the future. The first British pierrot troupes began entertaining the crowds at resorts in the late 19th century; within 15 years there were hundreds of them. To begin with, many wore the familiar white face makeup, the black and white costumes, pointy hats and pom-poms. Their songs and skits frequently referred to topical events and were sometimes racist and sexist. By the time of the first world war, the white faces had largely gone, replaced by boaters and blazers – as in Sickert’s melancholy painting Brighton Pierrots, in which a troupe performs to empty deckchairs, a reference to the young men missing because they were fighting, and dying, in northern Europe. When holidaymakers began flying to Spain rather than heading to Torbay or Blackpool or Skegness, the pierrot troupes, by then also known as concert parties, vanished. Uncle Tacko! has done his best to revive the form, creating his troupe, the Pierrotters, in the early 1980s. He argues that modern British music and comedy would not have emerged were it not for the pierrot troupes. “You couldn’t have the Kinks, the Beatles, the Coral and you couldn’t have The League of Gentlemen, Fawlty Towers, Benny Hill.” Nor, probably, the Krankies and Bucks Fizz, who are headlining all summer down the road at the Palace theatre (“Yes … they still rip the skirts off,” promises the publicity blurb). 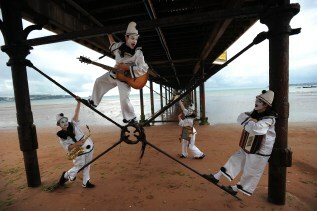 Mischa Eligoloff, from Torbay council’s culture unit, said the issues being tackled through initiatives such as the Pier Echoes’ performances were confronting resorts across the UK. The researcher with the clipboard, Jane Milling, senior lecturer in drama at the University of Exeter, said people had been “wildly enthusiastic” about the Pier Echoes.